R.G.N.A. : The Price of Music. After a fairly leisurely morning filled with fried eggs, toast and vacuuming; my friend, the girls and I went out shopping. Piano shopping to be exact. We went to one store that I had found through Craig's List. However we weren't too impressed. There was only one decent piano close to my price range. We weren't extremely discouraged, since we still had a few stores to go. But it was lunch time. We had Cheesecake Factory, complete with two slices of cheesecake split between the four of us. Two slices of cheesecake which we didn't even finish I might add. Then we headed to one store that must have closed or moved, but there was still one store to visit. We headed to Mesa. Milano's has a piano store across the street from the store we all went to a million times as youth because we were in band. We walked in, and only saw one piano close to my price range. Feeling quite disappointed, we checked that one out. I mentioned something about "under a thousand dollars" and a salesman came up, and said "We are cleaning up this Acrosonic over here, its only $695 and honestly in much better condition than the one you are looking at." We walked over, and my friend, whom I brought along for company but mostly because she is a wonderful musician, began to tickle the ivories. 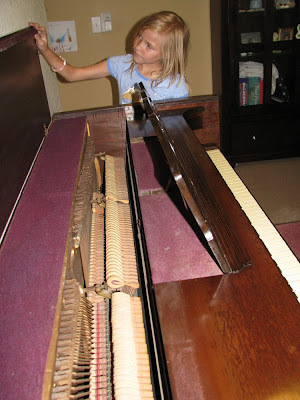 She glided her musical fingers up and down the keys and proclaimed it a better piano than the one at the first store. She opened it up, and looked at the pads, and said they were better than the piano at the first store. Then I played it a little, and told them I wanted it. The wood was a lovely rich, dark color and would go in our house well. The shape was interesting, it is more of a desk shape and was made in the 1950s. They told me the bench would be sent in to be reupholstered in a brown vinyl the next week, and I said, "No, thanks, I can do that myself." I can pick out a fabric that will look nice in the room it will live in, and get rid of the mauve fabric that currently covers the bench. I was led up to the front desk to fill out paper work. Then they asked "When would you like it delivered? Today? Monday?" Jaw dropping, "Today would be great." "How about between 4 and 4:30? (It was 3)"
"Well I need to drive home and drop my friend off, but that should work." "It will be about a half hour before we load it up, then we will be off." My friend offered to give Rhayn some piano lessons, including music theory, so we walked across the street to Milano's proper and she picked out some beginning piano books. Rhayn carried the books excitedly back to the car and looked at them all of the way home. We dropped my friend off, and went home. I vacuumed up the space which would soon be home to our new piano and we waited. At about five, the guy called and delivered her. I showed him her new home, and he put her there. Then Rhayn (who was hiding upstairs and wanted to come down the stairs as if it were Christmas morning to see a hippo hero standing there, oh wait, I mean a piano) walked down the stairs exclaiming her joy. Every few minutes I hear lovely "music" coming up the stairs. And the rich, happy sound that I remember from my childhood fills our house. I don't think I have ever spent money on anything that made me so very happy. i am so jealous! 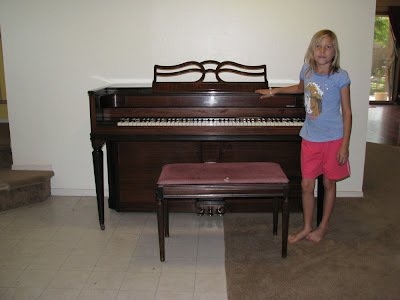 i LOVE piano, took harpsichord in college, and would kill for a piano for me and the kids. oh well, i can live through you! Its never to late to learn! And Homey, why don't you get a piano sometime? Its a worthwhile investment for you and the kids. I am so jealous!! My sisters and I all took lessons when we were children and played for years. 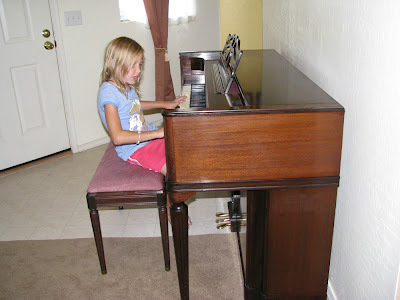 My older sister is still a great piano player! Have fun! It's nice that Rhayn is so excited to play. I am so glad you got one, we love ours! We haven't started any lessons yet but the girls have fun anyway. Great times. wow, it's gorgeous!!!!! So happy for you!! Thanks everyone, the joyful sound of banging on the keys fills our house and it is awesome. I am sure there will come a time when I have to ask them to stop and then a time when I have to BEG them to play, but for now... the simple one finger songs Rhayn is making are the songs I have heard in years. I love it! It's absolutely beautiful. I self-taught on an electric organ as a kid, LOL. My grandfather got it for me for $10 at a tag sale. I drove my mom up the wall with it. May you and your kids get years of enjoyment out of it. I'm so happy for you. The gift of beautiful music AND a bargain! Yay for you! Thanks for your thoughtful comments on my blog too!